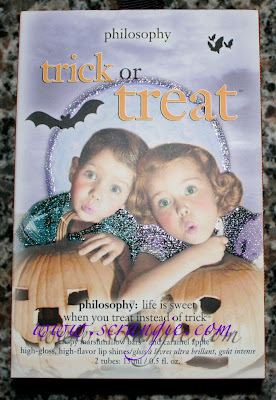 I can always trust Philosophy to have cute and irresistible things for fall and Halloween. Picked up this set the second I saw it in stock on Sephora.com! It's called Trick Or Treat, and this year's version contains Lip Shines in Crispy Marshmallow Bars and Caramel Apple. 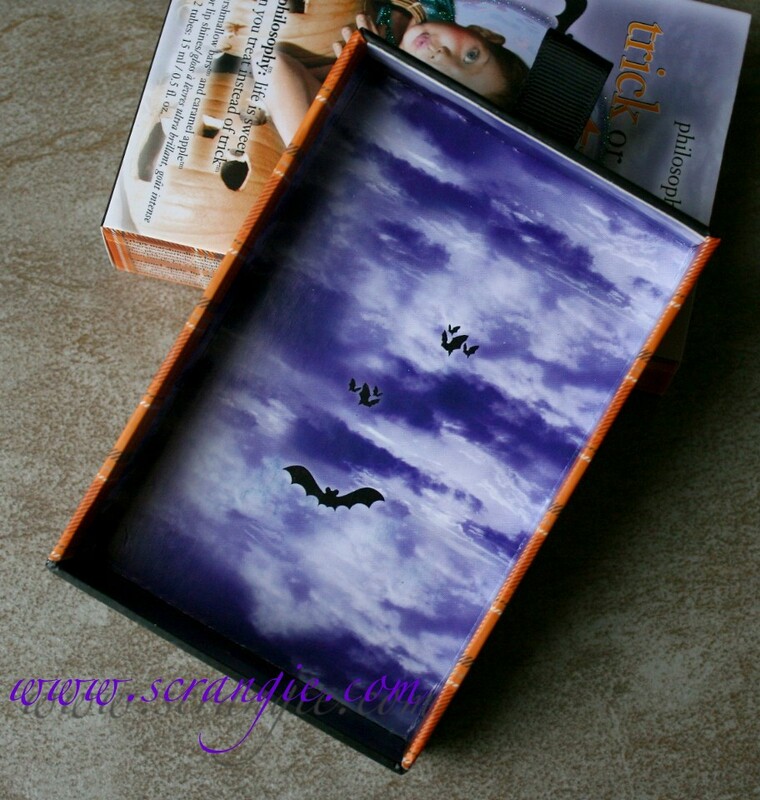 Cute glittery outer box with jack-o'-lanterns and bats. The inner tray slides out to reveal this after the gloss tray is removed! SO CUTE. It even has a little orange plaid design on the bottom and sides. It's so small that I'm not sure what to use it for, but it's way too awesome to throw away. The Lip Shine glosses: Crispy Marshmallow Bars (sheer milky ivory with light shimmer) and Caramel Apple (sheer dark red with shimmer). Like all Philosophy Lip Shines, these are very sheer and don't add much in the way of color or shimmer to the lips. Only a faint tint on the red, and only a whisper of shimmer on the white. No joke. The first thing you smell is butter, but then you start to smell that creamy, overly sweet corn syrup marshmallow scent, just like the real thing. You even get the slightly savory grain scent of the Rice Krispies to balance the warm butter and hyper-sweet marshmallow. 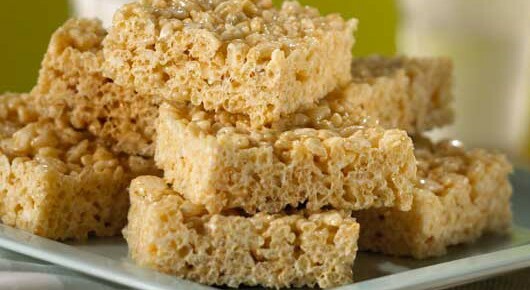 The Caramel Apple one is okay, but nowhere near as realistic and delicious as the Crispy Marshmallow Bars. 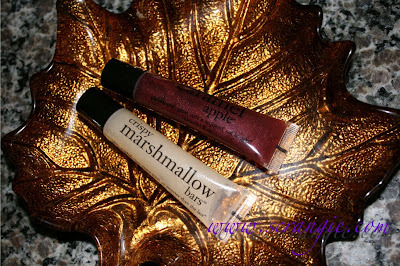 The Caramel Apple Lip Shine has a very sweet apple scent. It's not a tart or overly fake green apple candy scent like most apple scented products tend to be. It's definitely a red apple. The caramel isn't really present, but there is a flat, sort of chemical sweet scent on top of the apple scent that I suppose is intended to be caramel. If anything, this smells more like apple cider than caramel apples. They both have a sweet taste with a bit of the scent carrying over as flavor, so they're really nice to wear. The scents are both medium intensity, not too strong but not so faint that you can't smell them. They have a somewhat sticky texture, true to standard Philosophy Lip Shine formula. Average wear time. I'd totally buy the Crispy Marshmallow Bars one again (and now I want the 3-in-1 to go with it!) 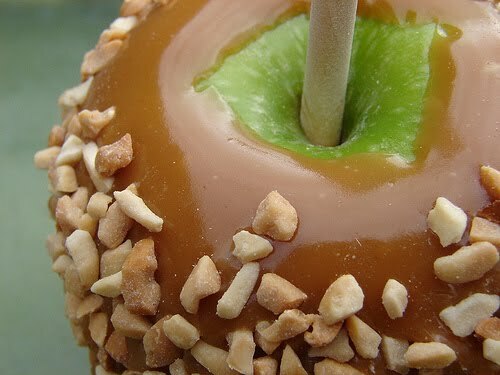 but I'm probably going to skip the Caramel Apple next year. The duo gives you a little bit of a discount; Philosophy Lip Shines are usually $10 each, but this set is only $18 for both glosses. I got mine from Sephora! Im a sucker for these lipglosses!!! These look great, I love all that is Fall and Halloween!!! Thanks for posting! Totally going to order these tonight! Scrangie, you're making me so hungry! :P~~~ Oh my gosh! Those photos and those descriptions! Haha! I've never tried anything from Philosophy other than their Purity cleanser (which I like). Maybe I should branch out and try their glosses just for the scent! Yum! The box design is too cute! Those glosses look yummy also or rather sound it. YOU HAVE TO GET THE MARSHMALLOW BARS 3-IN-1. It's preeeeetty much the best thing ever. EVER. Hands down my favorite 3-in-1. Hmm,I adore the Caramel Apple 3 in 1, it smells like the real thing! Maybe the gloss is different? i pretty much want this for the box alone! bats!